Toyohara Kunichika (1835-1900) The Actor Onoe Kikugoro V (Onoe Baiko) as Okiku, from the series One Hundred Roles of Baiko, 1893. Oban. This powerful design is from Kunichika’s series The 100 Roles of Baiko. Kunichika and Baiko were friends. This ambitious series, printed on fine paper and using extensive blind embossing and mica powder was commissioned by Fukuda Kumajiro in 1893. The bulk of each print portrays the actor Onoe Kikugoro V; the upper register shows a different actor in the supporting role. In this print, Kunichika shows Baiko as the servant Okiku in one of the most famous folk tales in Japan. There are several versions of the story and also several retellings in kabuki. The most popular, Bancho Sarayashiki, has the samurai Tetsuzan fall in love with the servant Okiku. She rejects his advances and in revenge he hides one of ten valuable delft plates, accusing her of breaking it. In one version she throws herself down a well in despair, in others Tetsuzan tortures the girl by continually dunking her in the well before killing her with his sword (the scene pictured here in the upper register). In all cases the ghost of Okiku haunts the well by counting to nine and then shrieking before starting over, sending the samurai mad. The well is apparently situated in the garden of the Canadian embassy in Tokyo. This series is one of Kunichika’s best portrait series. 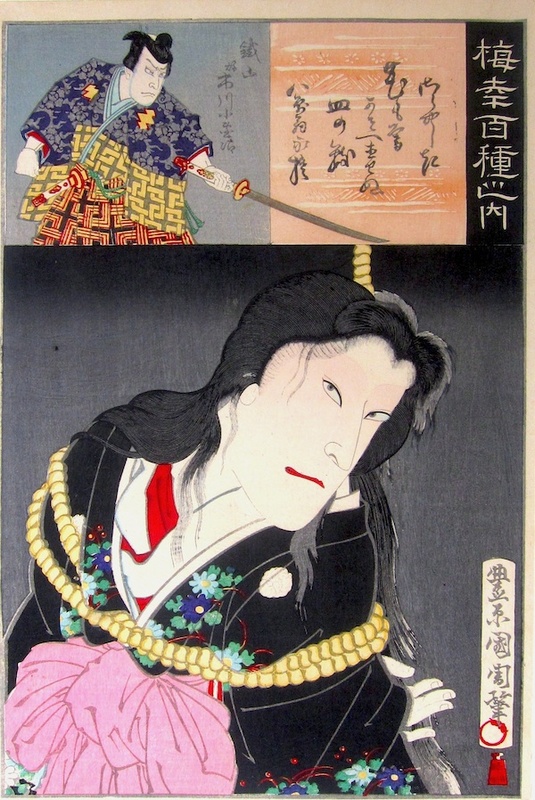 The quality of printing is exceptional and there is a great tension evident between the figure of Tetsuzan and the bound Okiku, Tetsuzan’s sword is outstretched as if to cut the rope that that suspends the housemaid over the well. Full size image, slight trimming to borders, fine early impression with grain visible and strong colours, exceptional shading to the deep greys and blacks of the background. Deep embossing to the collar and text box. Fine condition. Signed Toyohara Kunichika hitsu, published by Fukada Kumajiro.